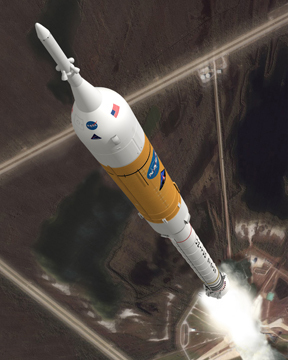 An artist's conception depicts the Ares I moon rocket during takeoff, with the crew capsule in tow. NASA announced Thursday that it has a plan to manage potentially dangerous vibrations that the vehicle may experience during takeoff. A potentially serious design hitch that could have set back NASA’s plans to return astronauts to the moon by 2020 appears to be resolved. In January, NASA Watch, a group that keeps an eye on space agency issues, revealed that NASA scientists have been carefully studying why the planned moon rocket Ares I — which will propel a moon-bound crew into space — is likely to have a serious case of the shakes when it takes off. But last Thursday, NASA scientists announced that months of investigation suggest the problem is very manageable. NASA’s Constellation team, which is still completing designs for the spacecraft that will take astronauts back to the moon, discovered the problem last October. Computer models of the propulsion system for Ares I showed that it was likely to shake violently during takeoff. How powerful the vibration would be was unclear — but the shaking could cause structural problems for the rocket and the crew vehicle, and could also be hazardous to the astronauts’ health. On Thursday, however, NASA scientists had good news: The shaking problem is “a significant but very manageable issue,” said Steve Cook, the manager of Ares Projects at NASA’s Marshall Space Flight Center in Huntsville, Ala. The problem itself — called “thrust oscillation” — is not unique to Ares I; it was also an issue in the design of the rockets used to launch the space shuttles. “It’s characteristic of solid rocket motors,” and occurs as a pulsing of the thrust late in the burn of the rocket's first stage, said Garry Lyles, the associate director for technical management at NASA’s Marshall Space Flight Center. Within the motor, swirling blasts of air create eddies. Those eddies then vibrate at a certain frequency, which is related to how long it takes for a pressure wave to travel from one end of the motor to the other. The vibrating phenomenon is similar to a musician blowing a horn: When done just right, the horn will resonate with sound. That’s a known phenomenon. But problems arise when the rocket itself happens to naturally resonate at the exact same frequency as the motor, Lyles said. One way to describe their combined effect is like pushing a child on a swing, he said: “As the swing starts to go, if you push your child at just the right [point], you can really get him going high. If you time it wrong, he won’t go as high.” Similarly, when a motor and vehicle both resonate at the same frequency, it takes very little force for the vehicle to vibrate. To study the issue, NASA assembled a team to first determine whether the problem was as serious as it appeared, and second to determine how to mitigate it. They found that the thrust oscillation didn’t strongly affect the structure of the rocket, which was sturdy enough to withstand stronger forces, Lyles said. The worst impact would be on the crew, which is “the most sensitive,” he said. Although the oscillation period would last only a few minutes, “we have to get the crew vibration down to a level well below the health limit.” Ideally, he added, the vibration would be low enough that the crew would be able to perform tasks during the launch, including being able to read the console. To do that, the team proposed two plans. The first would be to determine whether it is possible to alter the design of the rocket enough to change its own natural frequency. Adjusting the design so that the motor and vehicle don’t resonate at similar frequencies would bypass the problem altogether. The second mitigation option would be to add some “mass dampers” into the design — essentially, shock absorbers that would counteract the vibrations of the vehicle. That gets tricky, however, because engineers don’t want to add additional mass to the rocket; therefore, including shock absorbers could mean removing some mass elsewhere within the vehicle. For now, NASA plans to include the mass dampers, while still tinkering with the vehicle’s design to “detune” it — hopefully altering its natural frequency so that it no longer matches the frequency of the motor. If that works, it may be that the shock absorbers won’t end up being necessary, and at that point they’ll be taken out, Lyles said. For more on NASA’s return to the moon, check out Geotimes next month.